I just bought a Sunseeker 3250LE, and the owners manual talks about flushing the black water tank using the tank flush water valve “if installed”. Does anyone know where this valve is located? It’s sad that the manual is so vague about most things I look up. Post a pic of your water connections and members here will tell you which is which. Did your seller not explain this? 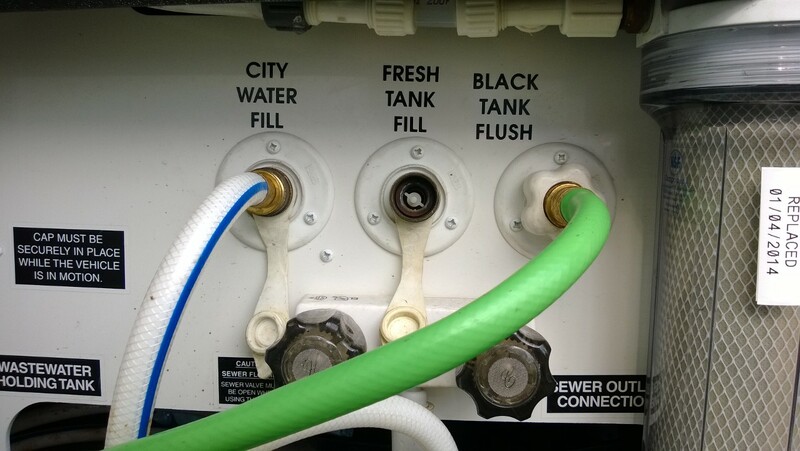 Many times....but not always, the "Black Tank Flush" is usually located within close proximity of the "City Water Connection" and uses the same type of hose fitting as the City water and are usually labeled Black Flush/ Black Tank Flush. We didn’t buy it new, so we didn’t get a lot of info. I know where the city hook up is, but it’s the only connection I see except for the sewage connections. I’ll post pictures when I get home. Leave it open when flushing or water from the black tank flush will fill the black tank and create BIG problems. And if you do close it for a short period of time to partially fill the black tank, DO NOT get distracted! I’ve got a 3050S and the black water flush is on the opposite side of the RV from the sewer hook up for some stupid reason. all the outside version does it provide a way to use a hose to put water in the black tank, versus the toilet. Depends on how/where the black tank flush spray port is located in the black tank and it seems they are all different. On my current R/V, the spray port is on the opposite side of the sewer port valve so it does a good job of 'pushing' the debris out of the tank with the valve open. On my previous model, it was mounted near the sewer port and pushed as much debris back in the tank as it did flush it out. In that case, I used it mainly as a fill port and let the large quantity of liquid 'woosh' it out, similar to your using the toilet to fill the tank analogy.